Gases that form when diesel fuel is burned with excess air. Microscopic solid particles and liquids that form during the combustion process. Gaseous compounds that result from unburned fuel and lubricating oil. Colorless, odorless gas produced when hydrocarbons in diesel fuel are not burned completely. Contrary to popular belief, diesel engines only emit a small amount of Hydrocarbon (HC) and Carbon monoxide (CO), so engine manufacturers primarily focus on reducing NOx and DPM. These two types of emissions are inversely related; meaning a reduction in one generally causes an increase in the other. Such a relationship complicates the management of them. The movement towards reducing diesel emissions began in the 1970s & 80s with the USA EPA investigating engine gaseous emissions from the heavy-duty highway diesel engines. The regulation of harmful exhaust emissions began in 2000 when the levels of NOx and DPM were controlled under a “tiered” series of emissions regulations which mandated a maximum level. A huge step forward was taken in 2000 when standards issued by the USA EPA fought about very large reductions in exhaust emissions for model year 2007 heavy-duty engines. These tiered structures now govern new static and off-road engines and equipment and establish progressively lower allowable emissions of NOx and DPM. Each progression of standard level – Tier 1, Tier 2, Tier 3 and Tier 4 engines are all lower in emissions and more advanced technologically than the previous generation. Essentially, the standards require that manufacturers reduce the levels of DPM and NOx to a level that is 50-96% lower than the existing generation of diesel engines. It is important to note that Tier 4 emission requirements apply to new products only and do not apply retroactively to any existing machines or equipment. 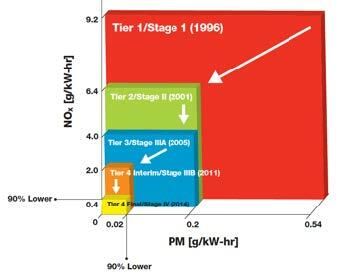 A simple diagram showing the reduction in emissions and the correlating engine tier rating is shown here.